A Penny's Worth / An Interview With Sports identity designer & co-founder of Brandiose, Jason Klein / Thoughts and insights from the minds and experiences of fascinating people. my close friends and family have a "jaded" view of magic now. My career is mostly "ho-hum" for them, except for the major events. But, for day in and day out shows, it's just "another job" to a lot of my close family and friends! Jason Klein is a sports identity designer and co-founder (along with Casey White) of Brandiose, whose list of design credits include Major League Baseball's Cincinnati Reds along with a plethora of minor league baseball teams. Thomas Jefferson famously said, "I'm a great believer in luck, and I find the harder I work the more I have of it." For every person making a living as a designer there are one hundred who aspire to. How did lady luck orchestrate your becoming sports identity designers? I've always loved the quote "Luck is when hard work meets opportunity." We began designing tons of logos for high schools in our hometown of San Diego. 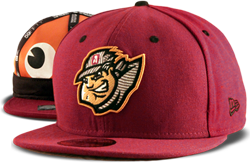 Our first summer, we sent our portfolio to 150 Minor League Baseball teams and one got back: the West Tenn Diamond Jaxx. They told us, "If we like it, we'll buy it." It was hard work earning our first team, but opportunity came. The idiom noting that the cream in milk always rises to the top is invoked to suggest that the best will eventually be noticed and rewarded. How do clients find you? The baseball industry is a real family style fraternity. Everyone knows everyone. No matter what service you provide, the industry is great at promoting companies they love, so most of the time the clubs find you. Trust inherently requires a wager, often an informed one, but a wager nonetheless. How are clients convinced to entrust their visual identity to you? When we started, we had no experience, and everyone was touting "design experience." We looked at the business world and saw all these 100-year old corporations with a ton of experience that provided terrible product and awful service. From that point we set out to deliver imaginative ideas and rockstar service, with no experience whatsoever. The ideas helped the Lehigh Valley IronPigs and Richmond Flying Squirrels become top selling merchandisers, and we built our brand on our ideas, not our experience. In April of 2007, The Washington Post organized an experiment in which Joshua Bell, "one of the finest classical musicians in the world" posed as a street musician in the metro playing "some of the most elegant music ever written on one of the most valuable violins ever made" while oblivious commuters passed by. Can you describe not just the the sensation of seeing your work being worn by players and fans, but their being oblivious to your role in its production? There's this weird moment in every project when it's unveiled. It's no longer this club and Brandiose project - it's now the fans that own the identity. It has meaning and context, and lovers and haters. 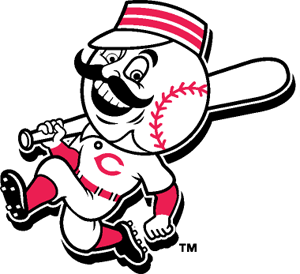 Every time I see the Cincinnati Reds on ESPN, I think of where I was when it was just a blank Illustrator file. Now it's a whole different thing. Metro-Goldwyn-Mayer's logo is adorned with the latin slogan, "ARS GRATIA ARTIS", meaning "art for art's sake", a philosophy whose virtues have been extolled by philosophers, writers and artists throughout the centuries. Visual identities on the other hand, exist not for their own sakes, but to fulfill functional purposes. Can you describe what these purposes are? Great question! A identity can be a celebration of a new ballpark, a new ownership group, a departure from the past, a fresh coat of paint, a relocation, or a merchandise energizer. Sometimes it's a political message that the organization doesn't want to be associated with that "other thing." Logo designers sometimes fight disparaging perceptions ranging from proverbial snake oil salesmen to glorified finger painters. How do you persuade clients of the tangible benefits of identity design? We measure brand success several ways: retail profit, how creatively empowered the staff becomes, staff productivity, attendance, loyalty to the brand, and fame and notoriety. Alex Bogusky once said, "If nobody's talking about your brand, it's dead." This plays a very important role in our process and how we measure success. Ralph Waldo Emerson famously described life as being more a journey than a destination, and while in the case of identity design the opposite is true, it's the journey which determines the destination. Can you describe the process of identity design from conception to implementation? There's nothing unique to our process. We start by visiting with staff, fans and community leaders and uncovering the soul of the franchise. Then we develop a universe that captures this soul. We fill it with characters, rituals, traditions, and logos - and they all come to life on a sketchpad first. We always explore how to best tell the team's story, then dream up the graphic elements to tell this story. Tools are nothing without a skilled wielder, but a skilled wielder is nothing without tools to wield. Which tools are at your disposal and which do you most commonly use when crafting a visual identity? Canson sketchpad, Moleskine, Canon 20D, bic ballpoint pen, Wacom stylus, Staedtler Mars plastic eraser, Staedtler 925 .03 mechanical pencil. Like lightning, inspiration can strike anywhere and at any time, but invoking it on demand is as futile as chasing rainbows or bottling lightning. In a field which requires liberal doses of inspiration, is the experience more like waiting for a thunderstorm or performing a rain dance? Our Brand Discovery visits always provide a mother-load of creative inspiration. We find ourselves in towns we've never been to, with incredible heritage, and unique stories that put their community on the map. They all come with unique colors, signage, textures and social dynamics. No two American cities are alike. The trick is to find out what makes this hometown unique and communicate it through the look and feel of the team identity. Any man is naturally partial to his own work as a father is to his own child. How do you objectively gauge the quality of your work? A quality project is where we increased retail sales, tried something new to make the team famous, empowered the staff creatively, and they felt we treated them like rockstars. Popping a cold one after-hours with all our clubs' staff members is important too. Mindful that its sometimes likened to being asked to choose a favorite among one's children or being asked to criticize a child's adoptive parents, can you talk about some of your favorite or memorable identity design projects? We always love telling great stories and trying things which have never been done before. Challenging the status quo is in our DNA. Collaborating with the Spokane Tribe of Indians on the first tribe-sports team identity collaboration, was groundbreaking and a real honor. 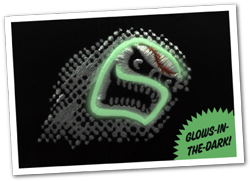 We also invented the first glow-in-the-dark on-field baseball cap for the Casper Ghosts, and the first on-field Rally Cap design for the Altoona Curve. Every minor league baseball player dreams of being called up to the big leagues. 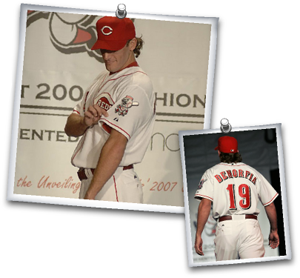 Was your literal call up to the big leagues working on the Cincinnati Reds identity also your proverbial call up? We've always made it a point to give every club we work with a world class experience. Every day we get to work with our best friends (the staff at all our clubs). We have the best job in America. While the Reds are a Major League franchise, working with MLB was like working with another good friend. No better or more important than any other friend. Like a father watching his son travel down the wrong path, are you ever faced with watching a client make a design decision against their own interest? We really don't look at the process this way. We're all on the same team trying to find the best way to tell the team's story. Once we agree on the story, there's no wrong way to take the brand. Creative careers often begin as passionate hobbies which become passionless occupations. How do you avoid falling victim to this fate? American baseball brands are more than clever cap designs. They're these captivating stories waiting to be told. Every day we come to play in these imaginative worlds where we're dreaming up new rituals, team villains, and even signature food items. Each team embodies a unique story, and poses its own challenges. So from a creative standpoint, there's endless ways to continue expanding and developing our teams' brands - and there's 160 Minor League Baseball teams! When you combine this with getting to work with passionate, creative and fun friends at each team, every day is a new adventure. Encouragement is fuel for the soul. What is some of the most encouraging feedback you've received? A very influential baseball executive once told us, "Nobody heard of [this team] until you guys put them on the map." It was the nicest complement we've ever received. Personalized team jerseys are often presented to celebrities, leaders and visiting dignitaries as token gestures. As a team's identity designers are you counted among the fortunate recipients of team merchandise, and if so, do you wear them or display them on the wall like a trophy hunter? Strange as it is, we don't have any of our work on display. We don't want to rest on our laurels, and always want to focus on celebrating the project we're currently dreaming up. Jason Klein's responses to straw polls at strawpolling.com / See how they compare to the consensus.